Created in 2008 as a tribute to metal, Mortör has since become one of Ottawa’s heaviest metal machine. Engineering thrash riffs, blistering drums, and death metal vocals, the five-piece made a name for itself over the years with its muscular grooves, party-like live performances, and bold imagery. After launching two pulverizing albums back to back, Metal Ride in 2010 and Shoot’em Up in 2012, and playing a large number of shows, the war metal household retreated to recharge its line up and compose its third album. In 2016, the band resurfaced, more vicious than ever, with a new secret weapon ready to be dropped upon the face of the world – Burn Up the Dead. The current line up consists of Dave Paquette, Mortör’s founder and main song writer, along with long time drummer Jay Cross (Accursed Spawn). 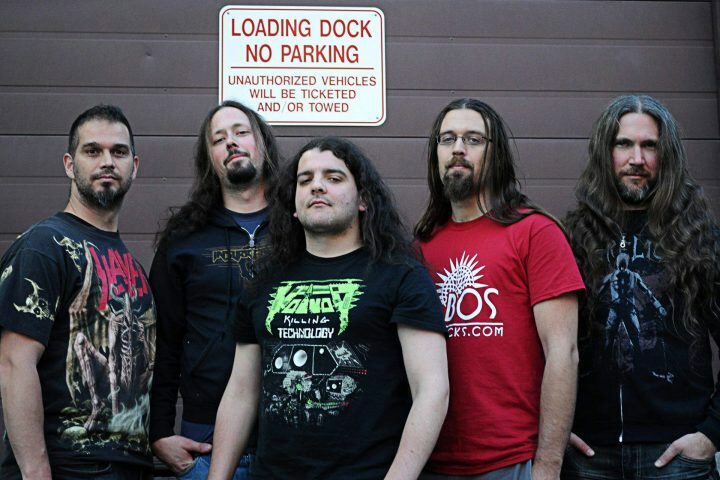 Former bassist Jonathan Boulay is taking over vocals duty, while Nicolas Miquelon (Norilsk) and Adam Pell (Accursed Spawn, ex-Aggressor) joined respectively on bass and lead guitar. Burn Up the Dead follows the tracks laid by the previous Mortör albums, and use similar firepower and tongue-in-cheek themes, but advances considerably further on all fronts: here the songs are more dynamic, more organic, more catchy, and more punishing at the same time. Refining its art, Mortör is more than ever a celebration of metal, and Burn Up the Dead is without a doubt its greatest delivery—all guns blazing. Death Metal/Thrash Metal. Created in 2008 as a tribute to metal, Mortör has since become one of Ottawa's heaviest metal machines. Released April 21st, 2017.